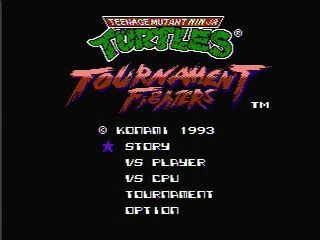 Developed and published by Konami and released in 1994, when anthopomorphic turtles were all the rage, the less well-known NES version of Tournament Fighters had you choose a turtle, assert ascendancy amongst the squad, and then beat up Casey Jones, Hothead, and Shredder for good measure. Teenage Mutant Ninja Turtles Tournament Fighters for NES is a very easy speedgame to learn and practice, relying primarily on AI manipulation and a few simple tricks. Mastery of the run requires understanding the game mechanics and timing windows a bit more precisely, but overall I encourage anyone interested in this game to pick it up and play through a few times. The meat and potatoes of the run is simply using Leonardo's Forward, Forward, B elbow strike into a tic throw. The timing of the throw varies based on whether the AI blocks, but either way the completed loop sets up the distance for the next attempt perfectly. Raphael is cool, but rude. He has a few unfortunate AI tendencies, but as he is the first run... I pretty much reset if I get hit here. A party dude. The least threatening turtle with the most cooperative AI and weakest life. This usually goes well. He does machines. He's also the most agitating AI thanks to his Blanka-ball looking attack, which he likes to use on reaction to your first elbow. In this run he was the only opponent to get a hit on me, as can be seen in the first round. While minor, this hit denies the perfect... causing additional time between round transitions. About as good as I ever do this, I believe it was a gold split. One flying kick (Forward Forward A) followed by two hurricane kicks (QCB A) will knock out a wall, so as long as you don't screw up the inputs it's not much of a problem. Incredibly weak life usually means that whatever he plans to do doesn't happen before the fight is over. My most consistent double perfect. This guy can be problematic. He has a lot of life and almost always blocks the elbow. I often go for an intentionally early elbow to trigger him to whiff the uppercut attack... as this gets me to the throw much faster than waiting for blockstun. The old chrome dome is fittingly the hardest fight in the run. He has a hard counter to the elbow (a hundred-hand-slap looking thing) that he does on reaction... so that strategy is not viable. Instead, against Shredder we approach with slidekicks (downforward + A). This will usually trigger him to crouchblock, although he sometimes has the nasty habbit of just throwing low normals and ruining the perfect. This was the only time I've ever gotten Shredder double perfects, as he was extraordinarily well behaved. Then I pointed at him. Big thanks to my TMNT mentor and WR holder LRock for teaching me this run. Thanks for the fun races at AGDQ 2018, buddy!